Just how many low carb egg recipes does anyone need? I say there are never too many. After all, if you're following a low carb diet or Keto or Paleo or some other version of a low carb way of eating, you know firsthand how eggs for breakfast over and over again can become quite boring. Hey, don't get me wrong! I'm not complaining about the fact that I can eat bacon and eggs fried in butter and still lose weight and improve my cholesterol, triglycerides and inflammatory conditions. I'm over the moon about that part! But I also know it's way more fun to eat eggs if they're presented differently from time to time, that's all I'm saying. And let’s face it, when something is fun to do and you enjoy it, you’re more likely to do it. So let me help you move beyond “over easy” or “scrambled” presentations. After all, eggs are ever so versatile… AND they're a great source of affordable and nutritious protein. 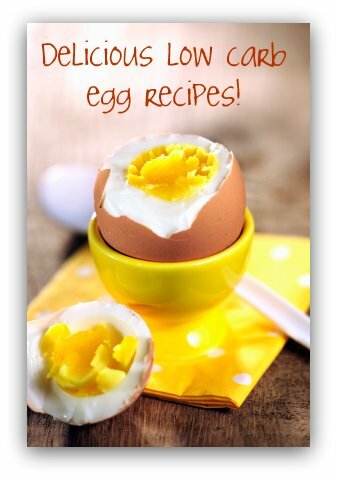 So many low carb egg recipes! So I’ve been developing low carb egg recipes that can be enjoyed at any meal... not just for breakfast. And even better, some are ideal for vegetarians while others include animal protein to satisfy the meat eaters among us. I'm also working on low carb egg recipes that can be served as desserts and as replacements for bread! Now THAT'S a low carber's dream! And don’t forget, for easy snacks or for lunches on the run, hard-boiled eggs are great! They’re portable and low on fuss. I boil up a dozen at a time. Keep them in the fridge with their shells on and they’ll keep for about 3 weeks. You can also make Scotch Eggs from boiled eggs. While I have you here... I'd like to recommend that you buy your eggs from a local farmer. The flavor is far superior as is the nutritional value. I'm really lucky, one of my neighbors has a hobby farm and I get all my eggs from her. They’re amazing! The shell is ever so hard, the yolks are a deep yellow and the whites are firm and not runny. You can't get any fresher than that! And they are delicious! Let's start with Omelet Recipes! Okay, let’s start with omelet recipes. Did you know there are many different omelets? Well there are, and they vary in difficulty as well. You can explore our Tips and Techniques for omelets or you can dive right in and create some of the following recipes. What’s an Egg Strata? Delicious… that’s what!! Well actually, the word strata simply means layers. In its original version, a strata begins with a layer of buttered bread slices placed in a buttered baking dish. A layer of cooked vegetable is spread on top, followed by a layer of grated cheese and finally the egg mixture is poured over the whole thing. For this dish to be low carb friendly, I simply had to remove the bread layer. Here are a couple of our favorites. Over the next months we will continue to add more low carb egg recipes to our site. If there is an egg recipe that you would like to see soon, send us an email using our CONTACT FORM and we will see what we can do to provide it. Do you have a favorite low carb egg recipe to share with us? Here's an opportunity to share it! Lay out your recipe just like those you have read in recipe books so it's easy to follow. Let's go from the Low Carb Egg Recipes page back to the Home page.